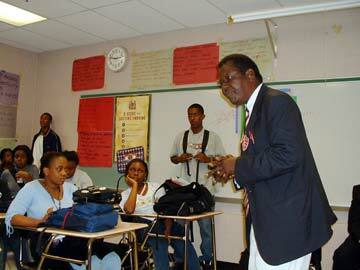 On Wednesday October 22, 2003 Blair High School and the African Club had a visit from Mr. Albert Kawa, the principal of Albert Academy Secondary School in Freetown, Sierra Leone. His visit to the United States was to celebrate his school's 100-year anniversary. Mr. Kawa was accompanied by several distinguished gentlemen who had graduated from Albert Academy Secondary School. During their visit to Blair they met with the principal, Mr. Gainous, and talked about how Albert Academy would become a sister school to Blair and planned for further interaction. Mrs. Mariama Turay, a well-known substitute teacher to the Blair community, arranged the visit. Mr. Kawa talked to the club about achieving goals as Africans and said other different encouragements and expectations of the club. He and the other visitors wanted us to write letters to them telling them about what's going on in Blair as well as the club. The African Club members were very pleased about their visit and were very impressed seeing the visitors wearing the Albert Academy uniform when they arrived. The club served refreshments and we went around introducing ourselves and country of origin. The guests seemed very pleased to see such a big group of students from Sierra Leone in the Blair community. They asked us to stand up and sing the national anthem from Sierra Leone, the pledge of allegiances from the U.S, and also the national anthem from other African nations both in French and English. The Albert Academy's principal presented a gift, an Albert Academy tie and badge, to Ms. Marville one of our club sponsors, who was a former staff of Albert Academy honoring her excellent work in the Academy for four years. Ms. Marville got her first teaching job at Albert Academy and was also the former teacher of one of the visitors. Ms. Marville is now a Spanish teacher here at Blair. The same gift was also presented to Mr. Gainous, the principal, and to Mr. Bellino the head of the ESOL department who was part of the Peace Corps in Sierra Leone. Mr. Bellino stayed in Sierra Leone for three years and has helped many students from Sierra Leone with their academics at Blair. The club officials, president Fatima Munu, vice president Mireille Nkongho, and secretary Kadie Kamara, thanked the Albert Academy visitors for coming to Blair and hoped that they would continue communicating with us. Each and every one of us enjoyed their presence, especially those of our club who did not know much about any school in Sierra Leone. We were very excited to learn about such a remarkable school that has been around for generations and is still standing even after the civil war in Sierra Leone. We all had a great time learning and interacting with the well-spoken principal Mr. Albert Kawa and his entourage, and look forward to continuing communication with Albert Academy. We were privileged to be a part of their centennial celebration. We were all extremely excited about having Albert Academy as a sister school.